The Marine Chain Pre-Pack contains a high quality Grade 316 Stainless Steel Anchor Chain. 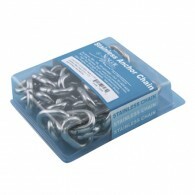 This marine chain is commonly used as lead chain for pleasure marine anchors. This pack provides additional safety and security when utilizing a ground tackle.